Japanese food is definitely more than just salad, they eat a massive range of different food which is really healthy and all of it (well except natto) is delicious. This is a win-win situation, you get to eat food which is even more tasty than your normal meals and it offers much more health benefits, surely the perfect diet! There are a few stand out items which are great for using in a Japanese themed diet. Check them out and buy them online below. Tofu is one of the healthiest foods in Japanese cuisine. Made from soy bean milk which has been set, it is used in a huge amount of different dishes, both sweet and savoury. There are a few different types of tofu available depending on what sort of dish you need to prepare. The main two types are silken tofu, and firm tofu. Silken tofu is very smooth and can be eaten with no preparation, used in desserts or baking or also as a replacement for things like cream cheese. 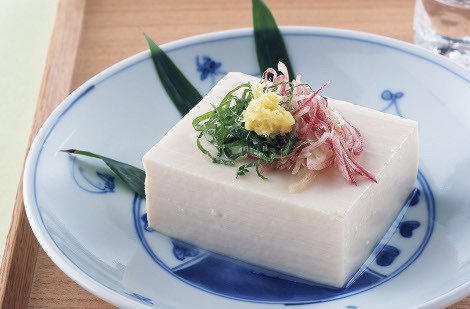 Firm tofu has a larger amount of water pressed out of it making it more solid and suitable for cooking. You can use this type of tofu for stirfries, hot-pots, soups or even on a barbecue. Firm tofu is confusingly available in soft, medium and firm varieties, but this is more of a personal preference rather than ways for preparation. Otokomae Premium Tofu – A delicious silken tofu, perfect for eating without preparation for use in desserts. Morinaga Firm Tofu – Although this is also a silken tofu, it is more solid and works great for stirfries. Hikari Fried Tofu Pockets – These tofu pockets are for making inari sushi, just fill with rice and enjoy. Normal firm tofu has a very short shelf life, so come and visit our Japan Centre shop in London to pick up some fresh, firm tofu. Hiyayakko Tofu – A summer dish which uses silken tofu served just with soy sauce. Mabo Tofu – A stirfried dish made with firm tofu cubes, ground meat and a spicy pepper sauce. Atsuage Tofu – This is made by deep-frying tofu, so better saved for a half-healthy, half-not-so-healthy occasional dish. Shirataki and konnyaku are both made from the starch of a Japanese variety of yam, affectionately known as the Devil’s tongue in English. 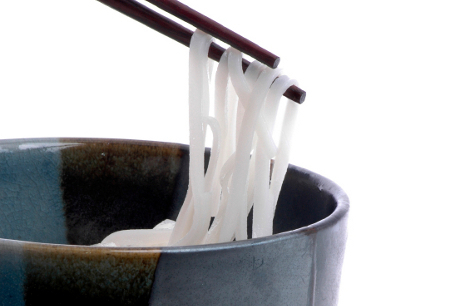 Konnyaku is a solid block of a jelly-like food, where as shirataki is made into noodles. Both of them contain hardly any calories, fat or carbohydrates, but are high in fibre and make a great substitute for normal noodles, pasta or rice for those looking to cut down on carbohydrates. Shirataki and konnyaku soak up all the flavours that they are cooked in so are a really versatile food which is suitable for lots of different dishes. Shirataki – Packaged in water and ready to be used straight away. Konnyaku – Also packaged in water in a block form. Just slice into bitesize pieces before preparing. Black Konnyaku – Similar to the normal konnyaku above, but with added seaweed to make it a darker colour. Shirataki Recipe Ideas – As these noodles can be used in so many different ways, we wrote an article with a selection of easy to make recipe ideas. Wakame is a type of seaweed that grows in abundance in the seas around Japan and has been used as a food sources for hundreds of years. It is a dark green seaweed which is usually sold dried to be soaked in water until it expands and becomes soft. After soaking in water, each piece is approximately 2cm x 2cm in size and commonly used as an ingredient in miso soup and salads. Wakame has delicious, slightly sweet taste, but is also consumed for its excellent health benefits. Wakame can help with all different types of weight loss diets and is a great supplement for healthy skin and soft, shiny hair. Fueru Wakame – Dried wakame. Just soak in water for 5 minutes before using in soups, salads, or any other dishes you like. Wakame Instant Ramen Noodles – These instant noodles come with loads of wakame included for some great tasting ramen. Miso Soup – Adding wakame to miso soup is easy and a great way to make this healthy dish even healthier. 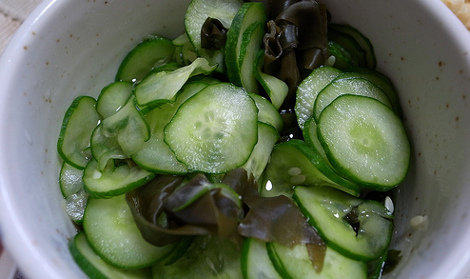 – Another way to use wakame is to mix some wakame in with your normal salads for an extra health boost or combined with cucumber like the image above. Miso is made by fermenting rice and soy beans into a thick paste which is used for seasoning a large range of traditional Japanese dishes. 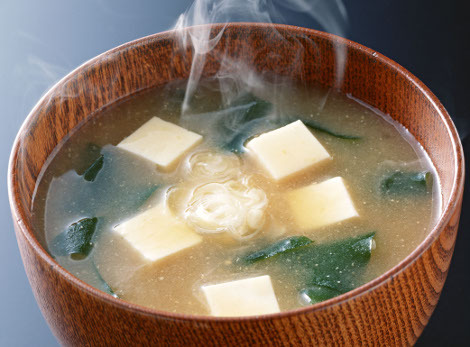 It is also commonly mixed with water and dashi soup stock to create the famous miso soup. There are two main types of miso paste, red and white. White miso is generally more popular in the Western areas of Japan such as Kyoto, and red miso is more popular in eastern areas such as Tokyo. The difference in taste between the two is that red miso has a stronger, richer flavour and white miso tends to be a little milder and sweeter. There is also a mix between the two called Awase miso which is good for all different cooking purposes. Miso has some great health benefits, including being rich in vitamins and protein. It can be quite salty though so less suitable for someone looking for a low sodium diet. Hikari White Miso Paste – A mild, slightly sweet miso paste. Hikari Red Miso Paste – Richer than white miso with a stronger flavour and darker colour. Nagatanien Instant Miso Soup – Just add hot water to these to make delicious miso soup quickly and easily. – Other ways to use miso include using it as a marinade for fish before cooking or mixed with oil to make a Japanese style dressing. Hara hachibunme translates as being 80% full. 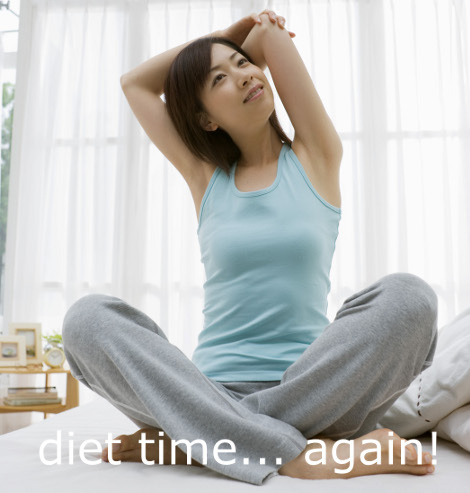 This is a common philosophy in Japan with regard to enjoying eating, but not to excess. 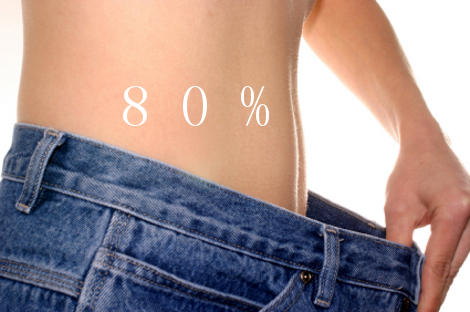 The idea is to eat more slowly and once you feel that you have reached 80% full, you stop eating. If you have eaten slowly, your brain will have a chance to catch up and remind your stomach that it is full. Eating a varied diet with lots of vegetables and some of these great tasting, healthy Japanese foods, as well as following the hara hachibunme idea means that you don’t have to give up eating tasty food to get healthy. You can find all these healthy Japanese foods, and many more at Japan Centre as well as many different authentic Japanese recipes to help you cook at home. Enjoy cooking Japanese food and look forward to a healthy 2011! Posted in Food and tagged Diet, Konnyaku, miso, new year, Shirataki, tofu, Wakame. Bookmark the permalink. Are there any books that lay these diet plans out for someone to do everyday? The book I’ve found which is helpful particularly in a Western setting is “The Japan Diet” by Naomi Moriyama. Gives you information about alternative Western foods that can be used in place of Japanese ingredients as well as some interesting recipes. Great site !Thank you very much !I will try your advice .Nice tips indeed ! Mochi Rice Pounding Event at Japan Centre 2011!